A new family of indigenous New Zealand birds has been created after a crucial discovery aided by the curator of Auckland Museum. Curator Dr Brian Gill and an international team of scientists have discovered that the stitchbird or “hihi” belongs to a family of its own and has no close relatives. 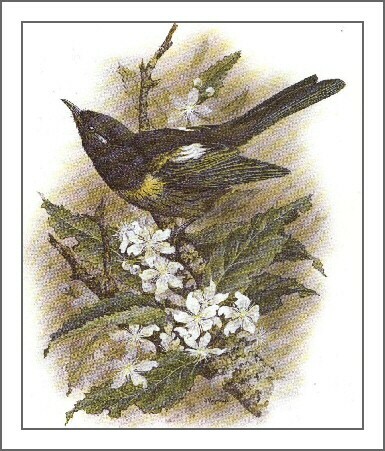 For years it was widely held that the stitchbird was part of the tui and bellbird family of honeyeaters. It was given the name Notiomystis cincta when discovered in 1908, derived from Greek words meaning “southern mystery” because even then it was thought a somewhat strange little bird. Now the mystery has been solved after the team comprising molecular biologists and museum staff from the United States, Australia and New Zealand have confirmed the stitchbird has no close relatives and is actually in a family of its own. There were thought to be only three surviving families of endemic New Zealand birds (birds only found here): kiwi (Apterygidae), New Zealand wrens (Acanthisittidae) and New Zealand wattlebirds (Callaeidae).